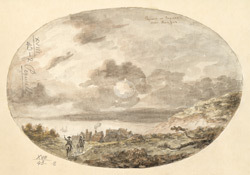 View of Pegwell Bay in Kent in the late 18th century. It was a quiet, coastal area with a few houses. Today it is part of Ramsgate. Pegwell Bay is known for being the landing place of the Danish ruler Hengist in 449 AD who occupied part of Kent. It was also where St Augustine landed in 597, on his mission to spread Christianity to Britain.